While April Fools’ Day was popularized in the 19th century (or 18th in the UK), its origins are somewhat vague. Historians continue to debate whether it started as early as 1392 because of a mention in Geoffrey Chaucer’s Canterbury Tales, or if it started later with the Gregorian Calender. What we know for sure is that it is celebrated around the world and the customs around it, while different in some parts of the world, all focus on pranks and humor. For instance, the joking/pranks end at noon in the UK. After that time, the joke becomes a sign of your foolishness. Hm mm. Nevertheless, here are 10 Facts to help you understand the genesis of this day of pranks and humor. 1. It has a writer’s touch because in 1392 Geoffrey Chaucer’s invented a Fool’s Day in The Canterbury Tales and it quickly grew popular with the aristocracy; they were the only ones who could read. 2. It has religious underpinnings because in 1582, Pope Gregory XIII adopted the Gregorian Calendar switching the beginning of the year from the Julian Calendar starting in April to his which started in January. He did it to confuse his detractors from remembering what date he promised to step down. 4. April Fools’ Day was connected to the vernal equinox/first day of spring in the Northern Hemisphere, when Mothers in ancient times threatened to give their kids away. Did you know that April Fools’ Day is taken seriously in parts of the world as people try to top each other with their inventiveness? In Ireland, the innocent fool is sent on errands with an “important letter’ that contains nothing of the sort but a joke. Over the years, TV stations and the general media have contributed to the hilarity of the day. 5. 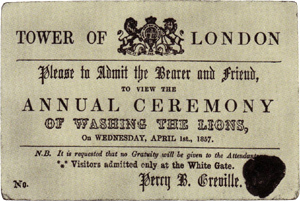 The first recorded prank happened on April 1 1698 when a popular paper (Dawks’s News-Letter) reported that “several persons were sent to the Tower [of London] Ditch to see the Lions washed.” When people arrived, they found sea lions being washed instead. 6. April Fools’ Day was celebrated in Scotland with a 2 day event/tradition called “hunting the gowk,” in which people dressed up as birds and hiding in bushes, they would jump out to surprise passersby with flapping wings and gawking sounds. 7. The earliest media prank was in 1957, the BBC reported that Swiss farmers had discovered a special kind of cheese that grew on a tree. They showed footage and many people were fooled. The maple syrup’s full of ants. Over the years, shows with a surprise or humorous element have come and gone. Shows like This is Your Life, Candid Camera with Allen Funt, and Punk’ed with Ashton Kutcher, kept people riveted to their TV sets and loving every minute of the shows. There were many others that came and went mainly because of the legal ramifications of invading other people’s privacy with inane jokes. Most of these shows gained traction from or gave inspiration to other prank moments in the media. 8. In 1985, Sports Illustrated ran a prank article about a female rookie pitcher named Sandra Finch who could throw a fastball over 188 miles per hour. They even had a picture of her. 9. In 1996, fast-food restaurant chain,Taco Bell, announced it was in discussions to buy The Statue of Liberty and would rename it – The Statue of Taco Freedom. People were riled up in NY until they learned it was an April Fools’ Day joke. 10. In 1998, Burger King advertised a “Super Dupper Whopper” that was 2 feet tall. May regulars wee stoked and lined up to order one… They soon learned it was an April Fools’ Day prank. Ha! PHOTO CREDITS/ATTRIBUTIONS: All Photos: Lars Anderson Subway, washing the lions, triple decker bus prank, from Wikipedia. This is a REALLY cool article. I’ve always wondered where this holiday came from. Thanks for the interesting read. LOL, I totally forgot about that Taco Bell Statue of Liberty prank. People were so upset about that. This is great information. I am pretty much assuming that anything posted online today could be a trick. I have never played any April Fool’s tricks. Oh April Fool’s Day…great memories!! I used to love Punked!! Neat to learn about but I’ve never been a fan of April Fools. I find people get a bit carried away and I get annoyed really easily! I’m glad it’s only once a year! I never would have thought to look at the history of April fools!! I was able to get my kids good this morning for the first time! I didn’t realize April Fools Day had such a long and storied history. Really puts the modern Internet pranks into perspective. Great fun post for April Fool’s Day…I’ll have to come back and check the answers. Thank you Elizabeth for putting all these together. Most of us, me included, just know about the pranks but don’t really know why we have April Fool’s Day. It’s always good to know. I forgot all morning that it was April Fools day!!! What great info! I had no idea there were so many recorded pranks throughout history. This was such a fun read for April Fools Day. I’ll have to come back to check the real answers later! Ahh so funny, I love the triple decker bus! Now I know where April Fools originated. Did not have an idea of this before so thank you! My summer babe loves to make jokes with me especially April Fool’s Day. This is a very fun article. I can’t believe people fell for that Taco Bell prank. I have to laugh at how riled up people got over it! It’s good to know what April’s food day is about. My daughter fooled me yesterday and I just laughed. April Fools Day was a big hit for my daughter this year! We played some pranks on her and she got us back. I didn’t know that there was this much history but will be looking forward to the correct answers. I believe that the sports illustrated article featured Sidd – a male, not female pitcher. So that one may be incorrect? It’s so hard to believe that it’s already April! Thank you for putting together this post. LOL those are some cool facts! It’s so funny that some people actually feel for those pranks! I guess I never really knew where April Fools Day came from. I just find it annoying because everyone uses that day to talk about how they are pregnant or their wife is expecting twins. As someone who can’t have kids, it gets painful. Its not something one should joke about. How neat that April 1st is celebrated different in different parts of the world. Thanks for sharing. I am not a fan of April Fools day at all. My kids were bullied in school and it was just an excuse for the bullies to tease other kids and call it a prank. My hubby is always pranking people he works with on April Fools. He tells me some of the things he does to them. Makes me crack up. I always forget it is April Fool’s Day until the day of! I would love to catch my husband by surprise some day! Very nice. I read it on Wikipedia the other day. Thanks for sharing information on April Fools’ Day for those who weren’t aware of the history behind it. I don’t have a sense of humor and my jokes are in pretty bad timing always. Last April 1, I just did not believe the surprising news in my Facebook wall because I knew that people will be posting jokes and pranks such as positive pregnancy tests. Interesting facts! One of my good friends was born on April Fools’ Day – I always got a kick out of that. However, as a child growing up, I bet it was torture. that was fun reading. Thanks for sharing this post. The first recorded prank was really funny. We’re not into pranks but my husband would be delighted to read this. We don’t do much for April Fools but I do enjoy a good prank every now and again. I had no idea how the day was started! Lol! Funny. This was interesting. I can;t wait to see the facts list. Ha! I would never have guessed that April Fools Day would have such a history! And I’m surprised at how many adults still like to play pranks. I had no idea there was so much to know about April Fool’s Day! Thanks for sharing. Great article. Thanks for sharing all these funny prank! When I was kid I use to plan so many tricks for my friends, though never thought of the idea when it was started.. thanks for making me knowing. We’re not big on April Fool’s here in my country but it’s always interesting to find out what other cultures do on this day. This is a good read, Elizabeth. LOL, I was just going to say some of the facts looked a little to crazy… so I was right! Same with what Russ have said, our country just followed what western people are doing. Like this April Fools Day event..most of my feed are full of “FALSE” or FOOLISHNESS post..ahahahaha…and though some are really cool jokes and love reading it. We don’t have April Fools here but some people have adapted to this holiday. They would prank others and such. This is a fun read and nice information about the holiday. Wow i didn’t know that april foold day had so old roots. Thought that it was just another modern 21st century event.. Great info elizabeth. thanks for sharing! i never knew the origin of April fools day. The world needs its share of laughter too. I hope we remember this on April Fools Day. On April Fools Day we always have a lot of fun, playing tricks on each other and the one who creates the most convincing pranks gets rewarded with a piece of cake. I was happy to read the facts related to this great day of fun. I’ve never been a fan of pranks because they can get carried too far. This is about it for me. Humor, yes. i was abroad on april fools and had forgotten to do something on that day! Interesting post. Thanks for sharing. Luckily this year I never get fooled by anyone.